This story is included with an NYT Now subscription. DNIPROPETROVSK, Ukraine — From his office atop the world’s biggest Jewish community center, Shmuel Kaminezki, the chief rabbi of this eastern Ukrainian city, has followed with dismay Russian claims that Ukraine is now in the hands of neo-Nazi extremists — and has struggled to calm his panicked 85-year-old mother in New York. But instead of reeling in panic at any fascist resurgence, the Jewish community of Dnipropetrovsk, one of the largest in Ukraine, is celebrating the recent appointment of one of its own, a billionaire tycoon named Ihor Kolomoysky, as the region’s most powerful official. A visual survey of the continuing dispute, including satellite images of Russian naval positions and maps showing political, cultural and economic factors in the crisis. “They made a Jew the governor. What kind of anti-Semitism is this?” asked Solomon Flaks, the 87-year-old chairman of the region’s Council of Jewish Veterans of the Great Patriotic War, a group of a rapidly shrinking number of World War II veterans. Since being formed in 1994, when it had 970 members, the council’s membership has fallen to 103, the result of old age and emigration to Israel. A few Jewish leaders do endorse Russian claims of a resurgence of anti-Semitism in Ukraine, but they are nearly all outsiders, most notably Berel Lazar, Moscow’s chief rabbi and a firm ally of the Kremlin. In an interview with the Jewish Telegraphic Agency last month, Rabbi Lazar criticized Ukrainian Jews for denouncing Mr. Putin and suggested they had played down the risk of anti-Semitism out of fear for their safety. Mr. Kolomoysky, the new governor of the Dnipropetrovsk region, derided Rabbi Lazar’s support for Mr. Putin as Kremlin-orchestrated propaganda. Russia, he said in an interview, has put pressure on Jewish leaders to fall into line with Moscow’s contention that Ukraine’s government was toppled in a fascist coup. 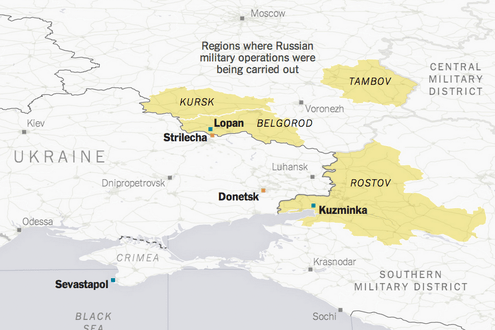 “Unlike in Russia, Ukraine’s Jewish community is not a lever of the state,” he said. Anti-Semitism is experienced in daily life, he said, but gets no support or encouragement from the state, unlike in Russia, where the security services have tolerated and at times nurtured neo-Nazi nationalist groups with openly anti-Semitic agendas. Russia’s state-run news media regularly air the views of Aleksandr A. Prokhanov, the editor of the Zaftra newspaper, a notorious platform for anti-Semitic conspiracy theories. Although not particularly observant, Mr. Kolomoysky, who is also the president of the United Jewish Community of Ukraine, has poured tens of millions of dollars into Jewish causes over the years. Together with a fellow billionaire, Gennadiy Bogolyubov, he financed the Menorah Center, the seven-towered, $70 million community center here where the veterans’ association, the Dnipropetrovsk Jewish Community and dozens of other organizations have their offices. Also housed in the building are the Israeli Consulate, a synagogue, kosher restaurants, a Shabbat-friendly hotel and a high-tech Holocaust museum. 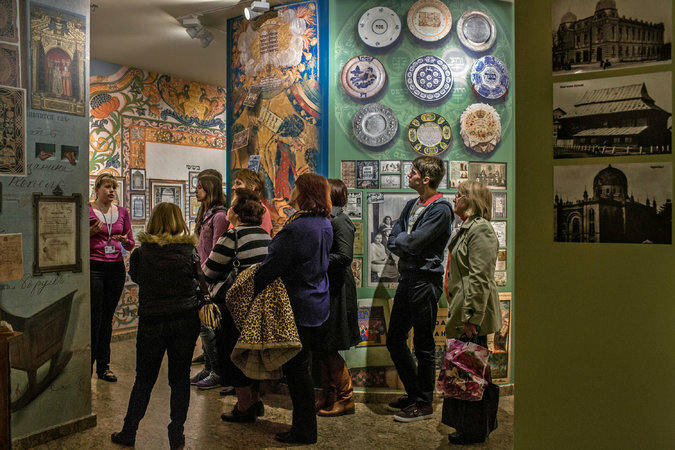 The museum skirts the delicate issue of how some Ukrainian nationalists collaborated with the Nazis when Hitler invaded Ukraine in 1941, explaining instead how Jews supported Ukraine’s efforts to become an independent nation. Before the Holocaust, Jews made up nearly a third of Dnipropetrovsk’s population, making it one of the most important centers of Jewish life and culture in Europe. The city now has 30,000 to 50,000 Jews, a small fraction of a total population of over a million but enough to sustain a vibrant community. The World Jewish Congress estimates that there are more than 250,000 Jews in Ukraine as a whole, the third-largest population of Jews among European nations. “This is an example of a Jewish renaissance,” said Rabbi Kaminezki, a member of the Lubavitch movement who was born in Israel and studied at a rabbinical college in Morristown, N.J. When protests against Mr. Yanukovych started in November, he said, many Jews shared the pro-European aspirations of the demonstrators who gathered in Kiev’s Independence Square, though some worried about the role played by far-right groups. One such group, Svoboda, stirred particular unease because of anti-Semitic remarks by its leaders in the past and its lionization of Ukrainian nationalist heroes who, in some cases, helped the Nazis and shared their ethnicity-based concept of nationhood. But Rabbi Kaminezki said fears of a fascist revival had faded, “as there is a difference between what these people say to their own crowd and what they do when they become legitimate political leaders.” Anti-Semitism, he added, “exists in Ukraine, like everywhere,” but it has shown no sign of increasing since Mr. Yanukovych lost power. After a series of unsolved anti-Semitic attacks since his ouster, including an assault on a rabbi and his wife in Kiev, the new head of Ukraine’s state security service told Jewish leaders that he would reopen a special unit to fight xenophobia and anti-Semitism that had been shut down under Mr. Yanukovych. Even Right Sector, a coalition of ultranationalist and in some cases neo-Nazi organizations, has made an effort to distance itself from anti-Semitism. In late February, its leader, Dmytro Yarosh, pledged during a meeting with Israel’s ambassador in Kiev to fight all forms of racism. Rabbi Kaminezki said most Jews were far more worried about the Russian troops massed on Ukraine’s border than about the risk of violence by anti-Semitic extremists. “Nobody is afraid of fascists, but everyone is afraid of war with Russia,” he said, noting that there has been an upsurge of interest among local Jews in moving to Israel because of worry about an armed conflict. Mr. Putin stoked such fears when, in his Kremlin address, he not only claimed Crimea as Russian territory but complained that “large sections of the historical south of Russia,” an area that includes Dnipropetrovsk and other parts of eastern Ukraine, had wrongly been incorporated into the territory of what until 1991 was the Ukrainian Soviet Socialist Republic. Mr. Flaks, of the veterans’ association, said he did not expect a conflict with Russia but worried that Mr. Putin underestimated the determination of Ukrainians, including Jews, to defend their country. In a recent open letter to Mr. Putin, representatives of more than 20 Ukrainian Jewish organizations noted their country’s political instability but told him not to act on Russian pledges to “protect” threatened minorities. “This threat is coming from the Russian government, namely from you personally. It is your policy of inciting separatism and crude pressure placed on Ukraine that threatens us and all Ukrainian people,” the letter said. A version of this article appears in print on April 9, 2014, on page A8 of the New York edition with the headline: Among Ukraine’s Jews, the Bigger Worry Is Putin, Not Pogroms.